Steve's R2-D2 Building Blog: The guy in the brown shorts always brings the best stuff! 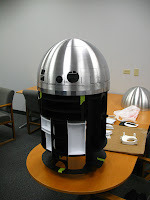 This blog will show the progress on my R2-D2 I am building for my wedding. The guy in the brown shorts always brings the best stuff! Got a package today at lunch. This is the one I have been waiting for the most since I started this project. Here it is in all its aluminum glory. 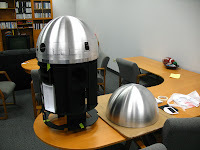 The 300mm Murrer dome! How beautiful is that! You can see the inner dome in the background. Here is a close up of the outer dome. 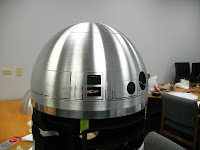 Here is the inner and out dome. Now I need to get the outer dome cleaned up and the inner dome cut to make room for the parts.